It’s no secret that in the fast-paced, everything at your fingertips world of Digital Marketing that timing really is everything. In today’s day and age we are always stretched for time! 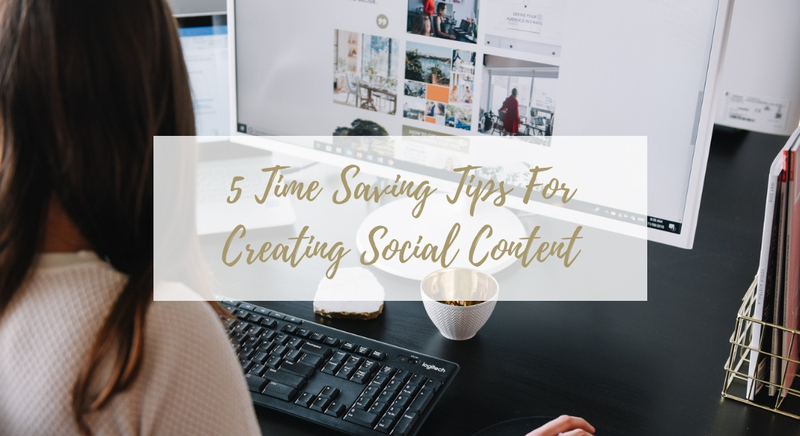 But having been in this business for some time now, we want to share with you our hacks that save us time when it comes to creating social content in such a fast paced environment. Multi-media has become the focus in the social media marketing world. It’s important to put the time into getting high quality images, graphics, and videos created so that your brand or personal account really shines. We recommend doing this in bulk, to save you time and energy in the long run. Take multiple changes of clothes to your photo and video shoots to give the illusion that you’re shooting the content on different days. This will allow get you a variation of content to use over a longer period of time – amazing! Shortcuts are the chocolate of the Digital Marketing world. We can’t get enough of them! Saving your hashtags in a shortcut document that you have easy, quick access to can really save you time in the long run. Scheduling bulk content is time consuming enough in the first place – by listing your hashtags under their content pillars in a single document, you’re saving yourself time and energy. Just make sure the hashtags are relevant and you have under 20 hashtags per post – no one likes hashtag spam. Pro tip: Hide the hashtags in the first comment rather than have them in the caption. This looks cleaner and seems like less of a like grab. Grab a cuppa, make it a double, and block out time in your schedule to power through planning content. We find planning a month ahead assists with the quality of the content we are producing and allows us a clear plan for the upcoming weeks. Running through any red flags or content issues prior to the content even being scheduled can save you not only time in the future, but stress and hassle as well. Structure your content like there’s no tomorrow. Content pillars are a terrific way to keep your content consistent and fresh, and the best part is, you can cater this to your target audience so you know you’re always providing the best for your loyal followers. Why do you think Kim K has so many followers? It’s all about being a brand – give the followers what they want to see. If bookmarks were Beyoncé, we’d be Jay-Z. Bookmarks save us the most time of all, having them laid out in client folders with each social account sitting there ready to go – it makes us so organised! We can’t speak highly enough of this point as a time saving element, and we guarantee you will see and feel the difference if you commit to giving bookmarks a go. Give these 5 tips a go and you’ll have so much time you won’t know what to do with yourself. Maybe its time to get a hobby? If you haven’t yet set up a Facebook Business Page for your agency or your own agent profile grab our freebie below for a quick guide on how to get started.